You can comment on the songs each week on our Feedback Forum or on our Facebook page. The Richard Bachman Show is broadcast every Friday at 5pm and repeated at 12noon on Tuesdays, or you can catch up with past shows on our Podcasts section. Every Friday at 4pm and 6pm. 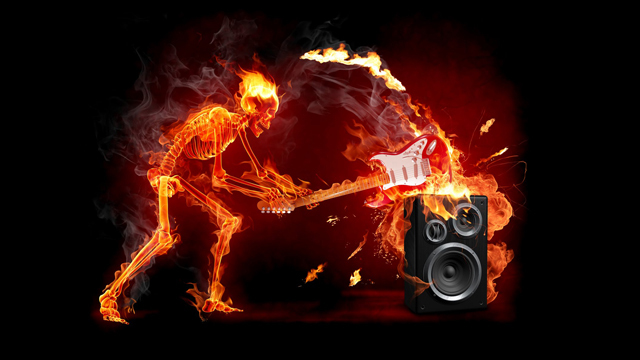 Featuring heaps of Murderous Metal, Terrifying Thrash, Putrifying Punk, and other spooky stuff. Each year Santa takes an axe to our playlist for Christmas Day and replaces it with three hours of our kind of Christmas songs from 9am to 12noon. Happy little Christmas tunes from bands like Venom, NOFX, Bad Religion, Rancid.. you know the bands we play. our Official Launch was Saturday 7th May, 2016. Each year to celebrate our Anniversary, Rohan Khan Brown, host of the Richard Bachman Show choses his12 BEST SONGS OF THE PAST 12 MONTHS. You can hear the Richard Bachman Show FIRST Anniversary Special (2016-2017) and check out the videos of the songs HERE. And you can hear the SECOND Anniversary Show (2017-2018) and check out the videos of the songs HERE. 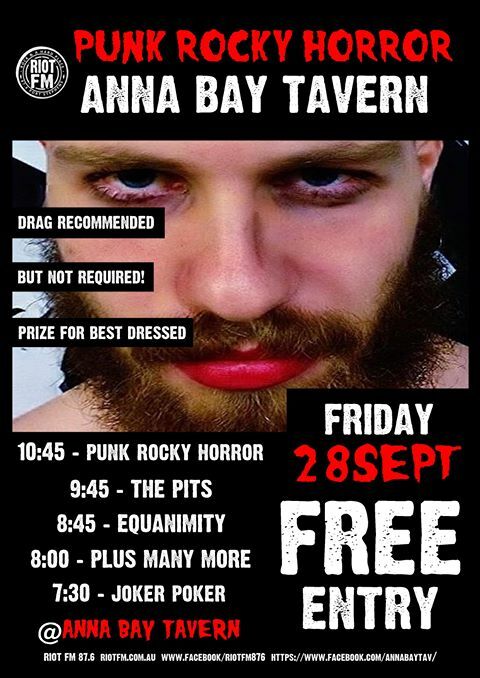 Friday the 28th of September, at ANNA BAY TAVERN, PUNK ROCKY HORROR is a showcase and celebration of local rock horrors. all building towards our in a punk rock rendition of the cream of the rocky horror crop. With 4 bands for absolutely FREE, you can’t afford to stay home. Drag and dress up is recommended but not required... prizes for best dressed. PUNK ROCKY HOROR, 8pm Friday the 28th of September at ANNA BAY TAVERN. Riot FM is proud to support Thrashville. 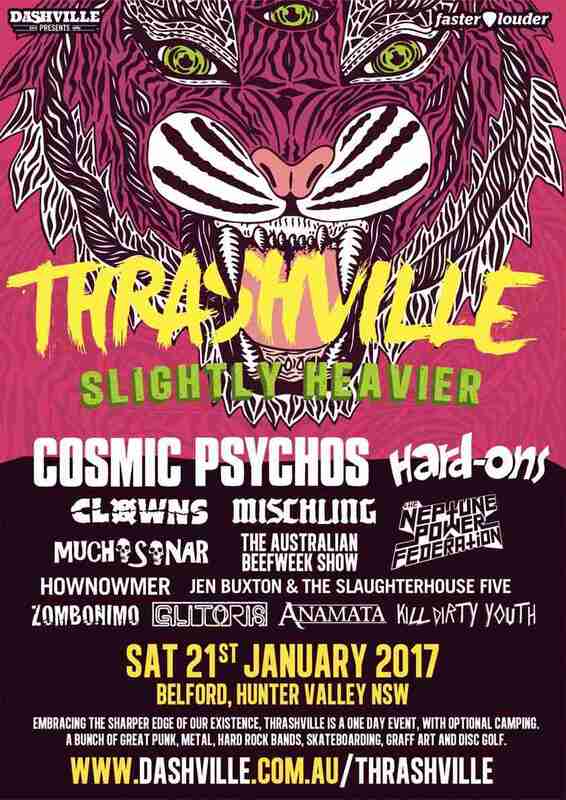 Thrashville is a new punk, hard rock and metal festival in the Hunter Valley, featuring legends like Cosmic Psychos, the Hard-Ons, Clowns and many, many more, along with loads of awesome extras like skateboard demos, graff art displays, delicious food stalls, markets and more. The one-day event is on Saturday 21st January in the sacred grounds of Dashville, located in the bush at Belford, in the Hunter Valley. Tickets $55. Camping $15. Thrashville is proudly supported by Riot FM. 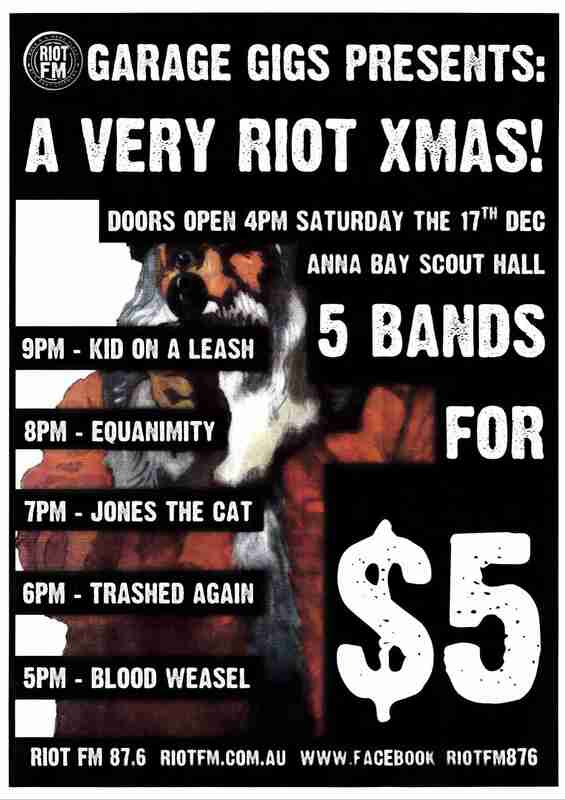 Riot FM presents "A VERY RIOT XMAS" at the Anna Bay Scout Hall.. SATURDAY 17th DECEMBER, 2016. Doors open at 4pm and kicks off at 5 with Riot FM house band BLOOD WEASEL, followed at 6 by local boys MATT HEALEY and BENN GUNN in punk outfit TRASHED AGAIN, Newcastle heavy hitters JONES THE CAT at 7, more locals with JOSH MORGAN and KARLO ZANKI in EQUANIMITY AT 8PM, and culminating with our headliners at 9: KID ON A LEASH out of Newcastle. Five bands for $5 !!! Riot FM is proud to sponsor the mind-blowing “Punks & Poets Festival” at The Lass O’Gowrie Hotel, Wickham from 12 noon to 9pm on Sunday 27th November, 2016. This is going to be a huge celebration of Newcastle's alternative music!! A big ol' Sunday festival on two stages featuring inside great Newy bands: The Longnecks, Paper Thin, Southern End, Voodoo Youth, shysters, Space Carbonara, Kid On A Leash, MayDay Way Hey, Jones The Cat. PLUS acoustic acts: Rachel Maria Cox, Bofolk Ballico, Jemima, Boots Porter, Aitäh, and Manic Pixie Dream Gorilla outside along with an Art Exhibition and BBQ in the Beer Garden. It’s going to be a huge day of live local music and good vibes. The “Punks & Poets Festival” at the Lass Sunday 27th November, 2016 … Put together by the guys from The Longnecks, and proudly sponsored by Riot FM. 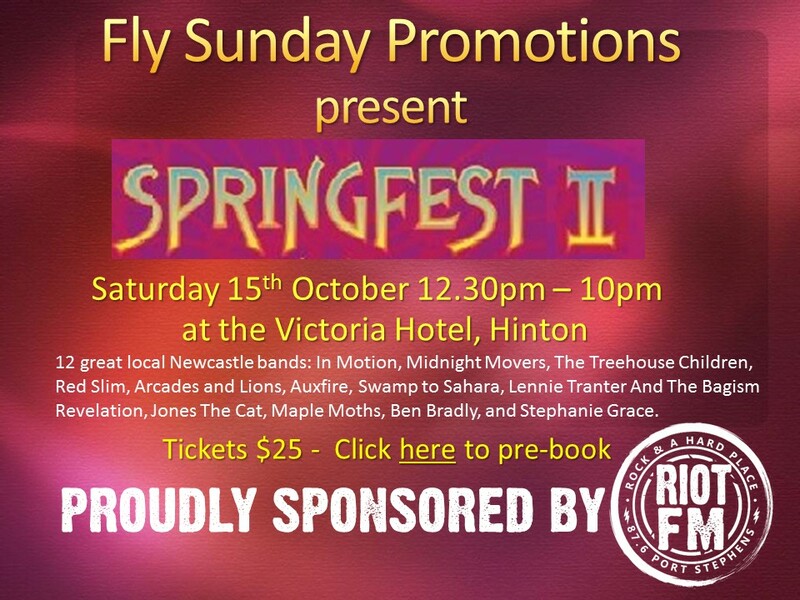 Fly Sunday Promotions presents SPRINGFEST II… proudly sponsored by Riot FM... Saturday, 15th October, 2016 at The Victoria Hotel, Hinton. Gates open at 12:30pm for a jam packed day of live music through til 10pm … with 12 great local Newcastle bands.. In Motion, Midnight Movers, The Treehouse Children, Red Slim, Arcades and Lions,Auxfire, Swamp to Sahara, Lennie Tranter And The Bagism Revelation, Jones The Cat, Maple Moths, Ben Bradly and Stephanie Grace. There’ll be two food trucks, booze and coffee as well! presented by Fly Sunday Promotions and PROUDLY SPONSORED BY RIOT FM. 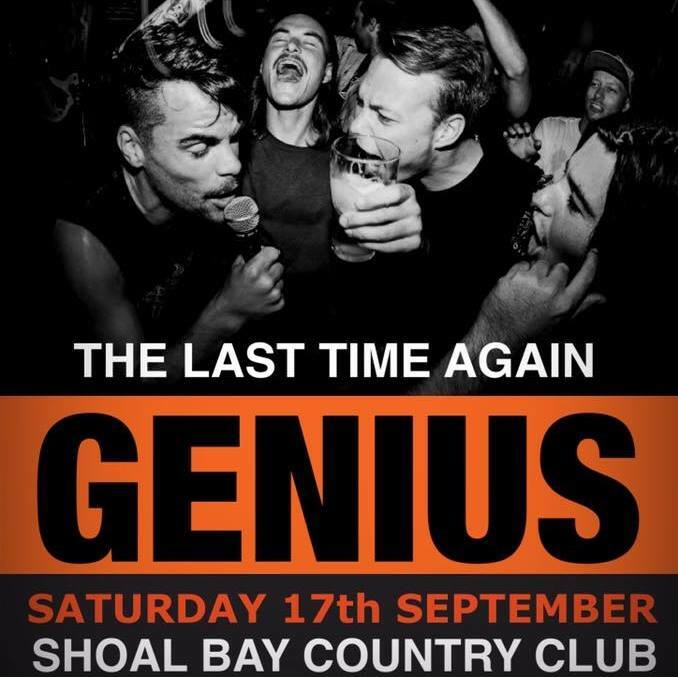 Local Port Stephens/Newcastle punk band "Genius" are reuniting for a one off gig at the Country Club Hotel, Shoal Bay on Saturday 17th September, 2016. Get along to catch Genius for the Last Time again at the CC Saturday 17th, presented by Riot FM. VENUE: Port Stephens Country Club Hotel, Shoal Bay Road, Shoal Bay. LHey, Riot FM is a holding a launch party… yeah, we know we’re already on the air… but, what the heck, any excuse for a party.. So, our OFFICAIL PORT STEPHENS LAUNCH will be at the Country Club Hotel, Shoal Bay on Saturday 7th May, 2016. 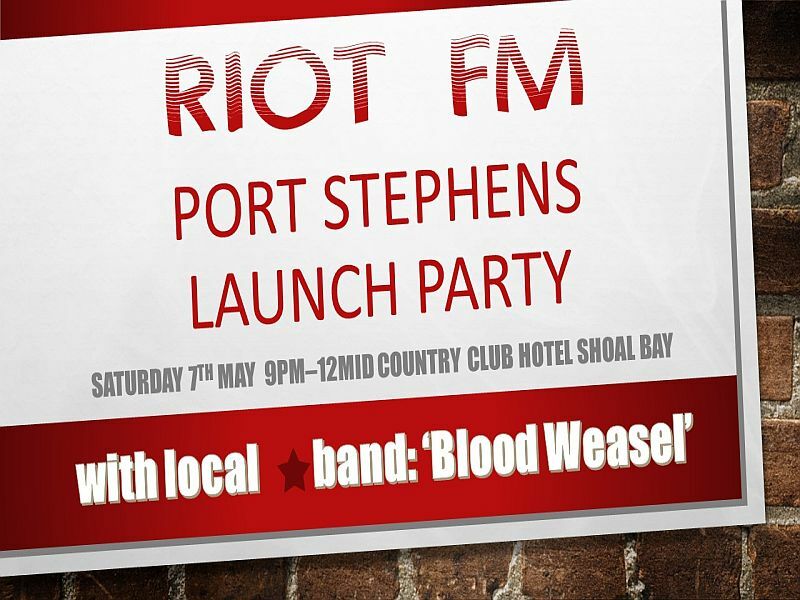 It kicks off at 9pm with Riot FM House band BLOOD WEASEL playing through until midnight. So come along and help us celebrate… Country Club Hotel, Shoal Bay 9pm Saturday 7th May, 2016. Content copyright Riot FM © 2016-2018. Template copyright © 2014 by WebThemez.com.